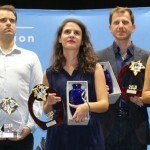 The French Chess Championship took place from August 18-26, 2018 in Nimes. 891 players took part in all the events! In the man and women championship it was 10 players round-robins. By beating Natacha Benmesbah in the last round, Pauline Guichard won her first title of champion of France! Pauline was making her comeback in the Women’s National after 7 years of absence, and she made a great performance by winning no less than 7 games, conceding only one draw and one loss-7.5 points! She is ahead of Sophie Milliet 6.5 and Cécile Haussernot 6 points, respectively 2nd and 3rd. A chess playoff was required as 3 players tied for 1st: Gharamian, Edouard and Gozzoli all with 6 points out of 9. Tigran Gharamian wins his first title in France by winning ties against Yannick Gozzoli and Romain Edouard. A victory at the end of the suspense since Tigran Gharamian won the Armageddon blitz against Romain Édouard.